I have seen the future in IT. Due to some anomaly with the space-time continuum, I was sent to the future! I saw some key upcoming disruptions and was sent back to warn you all, so we can prepare for these disruptions now, before its too late. Oh, while I was there, I accidentally killed someone called Sarah Conner, hope that does not bite us in the @$$ later! Everything that we find normal is GONE, and we better adapt or die! The Microsoft Tech Summit I recently attended confirmed a few big changes in the not-so-far future that we better prepare for NOW. 1. 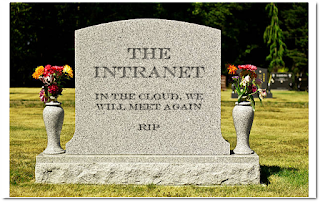 The Intranet is no more. Do you still use your intranet? No, like really use it? The intranet was a platform for collaboration, but these days, people use it to access their leave form, expense claim form, maybe the corporate telephone directory, see pics from the corporate function or to see the canteens menu and, well, that's about it. We don't use it for collaborating, people are now collaborating via tools like MS Teams.